Time to set the monthly goals and make them happen! February will continue the Paleo diet 6 days a week. Weigh and measure on Fridays to see if the BF% and inches decreasing. I am going to measure my weights on Monday February 4 in Body Pump write them down so I don’t forget them and check my weight increases on March 1. I am not currently running. I will continue my cardio a mim of 3x per week. Keeping my heart rate between 80-100% of max. One day a week I will do Body Flow to relax my brain and stretch my muscles. I am going to use these relaxation techniques when I get over active mind syndrome in the middle of the night. 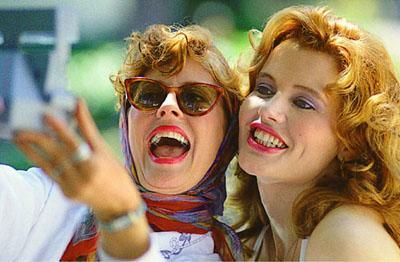 Are you a Thelma or a Louise? Take this quiz to find out! More to come! I am Louise, I love the idea of freedom, I am strong and nobody will control my life. Do you and your friends or co-workers have any holiday traditions? Each year a group of us get together for a cookie exchange. Since I am doing Paleo this holiday season (down 4.8 lbs since 11/30) I will be taking my cookies to a Christmas party this weekend. Are you wondering what a cookie exchange is? Some of you might think it’s an opportunity to bring a couple of cookies and have coffee and chat. Well, our cookie exchange is a bit more than that. This year we had eight ladies participating in the cookie exchange. Each person makes a different kind of cookie and you then exchange a dozen of the type you bake. Since our group had eight ladies we each had to make 7 dozen cookies to share, 8 if you wanted to keep a dozen of your own kind for yourself. In the past I made my favorite cookie the Hershey Kiss Peanut Butter cookie. My grandmother made these every year for Christmas. The year I made them for the cookie exchange I had 60 kisses to unwrap so thought I would do something easier this year. When searching for a cookie to make I stumbled upon the “Puppy Chow Cookie”. Are you familiar with the Puppy Chow Snack mix? “This absolutely delicious snack mix is one of my favorites. People gobble it up – well, like puppies gobble puppy chow!” My daughter loves the snack mix so I thought this would be a great cookie to make. Almost better than the snack mix. 2 hours and seven dozen cookies later my kitchen was a powdered sugar disaster and I was beat. What the heck was I thinking? I thought this would be an easy cookie to make. Next year I think I will stick with the basic Chocolate chip cookie or a cocktail swap. The cookie exchange was fun. We all shared our kitchen stories, making multiple trips to the grocery store, mixers breaking, marshmallow’s burning, cookie press breaking, high altitude flour not working and naked ginger bread men. I have a large bag of cookies to take to my Christmas party. Decorated sugar cookies, Ginger bread men, Coconut Mounds, Ginger snaps, Salted Carmel Thumbprint’s, Macaroon’s and a plate of assorted cookies. What is your favorite type of cookie for the Holiday season? Week two of the one month Paleo challenge is coming to an end. December is definitely the month you want to do a CHALLENGE like this. I know I am crazy, but let me share my thinking on this. My office like most offices around the country has all kinds of goodies during the holidays. I personally find it fun to see if I am strong-willed enough to pass on eating all the goodies. We have had sugar cookies (one of my favs the kind from the grocery store with lots of frosting), peanut butter fudge, biscotti’s, cranberry bread, cupcakes, apple cider and hot chocolate. Back to why I think this is a great challenge to do. The first being, do we really need to eat all that junk just because it’s the holidays? The second I find in fascinating that I can lose weight while a lot of others are gaining weight during the holidays. To date I’ve lost 3.4 lbs since starting the Paleo challenge on December 2, 2012. Now my actual goal is to get stronger and leaner and I think both are coming along nicely. Lastly, the strong-willed mind can make or break a challenge anytime of the year! It’s all in the mind! Week 2 has been interesting for me. When I attended Kickboxing on Wednesday morning my energy level was low. I am thinking I didn’t get enough fruits/vegetables in the day before. Today I ate ½ of a Banana before my workout and I had amazing energy. I also am learning that either by taking out dairy or gluten my body functions much better or it’s adding in the extra fruit. I am a vegetable eater and eat about the same amount of vegetables as to what I ate prior to this challenge. Here is a great story from “The Chef” and my daughter. Let me start by sharing that my Dear Daughter was not hip on changing up our eating habits. She gets what we eat plus whatever else she would like rice, pasta, bread, chips, crackers, granola bars etc…. I am sitting at the dining room table wrapping Christmas gifts she is searching for a snack in the refrigerator on this particular evening. Keep in mind she could be eating anything that is in the pantry and the refrigerator. Oh my I just busted up laughing! I think because my DD could eat ANYTHING in the house and she wanted the raspberries. So if you are will minded enough you too can be successful during the holidays on the Paleo Challenge! It’s not too late to start! This time of year Ugly Sweaters are in high demand. I was invited to meet some of my girlfriends for Happy Hour on Friday night and we all were to wear Ugly Sweaters. I had no time to search the second-hand stores or the Good Will. So I started asking around at work to see if anyone of my co-workers had an Ugly Sweater that I could borrow. Not a single one in my office had one. I used my resources and asked another co-worker from down the hall. She was hilarious when I called her. She said she was appalled that I thought she would have an Ugly Sweater and as a matter of fact she did have one. I didn’t win the Ugly Sweater contest but did have one to wear! Do you have themed holiday parties? Stay tuned for my fabulous Holiday Drink recipe coming up next week. December Paleo Challenge are you up for it? For those of you who know me I am always up for a challenge. Yep, I’ve got a new challenge this month. My family and I are going Paleo from Dec 2 – Jan 2 with a couple of modifications.